I’m a big fan of the Negroni any time of year, but its sweet boozy balance makes it the ideal winter cocktail. This version uses Ungava gin, a Quebec product with botanicals like Nordic Juniper, Wild Rose Hips, Cloudberry, Crowberry, Arctic Blend, and Labrador Tea. Mixing it with another native ingredient, cranberries, makes this cranberry Negroni about as Canadian of a cocktail as they come. Happy sipping. Pour everything over ice, stir, and drink. August 26 and I am currently in Zurich, Switzerland living the dream – and eating way more chocolate than is healthy for a single individual to consume. Today’s guest blogger is Kare from one of my favourite blogs, Kitchen Treaty. The whole concept of the site is pretty cool, she’s a vegetarian but still cooks meat for the rest of her family and thus has to find ways to make meat an add-in to otherwise vegetarian recipes. Sounds like my life. Except that I generally get lazy and just eat salad after making stuff for everyone else. However, none of that is an issue with this chocolate iced coffee. Forget the coffee, let’s just drink the homemade chocolate syrup. Thanks for sharing Kare, I will let you take it from here. Hello hello, readers of Mallory’s wonderful blog! I am thrilled to meet you. When Mallory asked me to write a guest post for her blog while she was on vacation, I was all over it. I’ll be honest, though – I had no idea what kind of recipe to share! Until it hit me – duh – it had to have chocolate. Of course! With it being the peak of summer, I’ve been on iced coffee overload. I love the stuff! I cold-brew jugs of iced coffee all summer long, and one of the ways I love to treat myself on particularly harried mornings is by adding a good glug of chocolate syrup to the mix. Live a little, right?! Because cold-brewing iced coffee helps keep bitter-tasting acids at bay, it usually tastes remarkably mild and, depending on the beans you use, it often already tastes kind of chocolaty. So giving that flavor note an added oomph with chocolate syrup is a natural segue. Add in some cream – a must for iced coffee in my book – and you’ve got a rich, decadent caffeine buzz to kick off your morning. So should I have called this a mocha? I don’t know! Iced Mochas are a popular coffee drink but they’re made a little differently – with espresso instead of cold-brewed iced coffee. Mocha Iced Coffee sounded weird, so I went with Chocolate Iced Coffee. No matter what you call it, it’s worth making. And drinking. Often. To make the cold-brewed iced coffee concentrate, add the ground coffee beans to a large jar or pitcher with an air-tight lid. Pour in the water. Stir. Seal and let sit at room temperature for 6-12 hours. To make the Chocolate Iced Coffee, add coffee concentrate and chocolate syrup to a large glass and stir. Add a splash of cream or milk if desired. Taste and add additional chocolate syrup or cream if you’d like. Fill glass with ice and serve with a straw. For the longest time I hated the taste of alcohol. I don’t know what it was, it just didn’t do it for me. It was like, “why would you wreck a drink with this when it tastes better without it?” Crazy people with all of your alcoholic beverages, I will take mine virgin please and thanks. Well sangria sure changed that mentality in a hurry. How can you go wrong with a big old glass (more like 4 glasses) of fresh summer fruit, soaked in some sort of fizzy, fruity juice? Oh there’s wine in there too? No problem. In fact, it is the perfect drink for a summer BBQ party. And with that smooth segway, I am pleased to announce that this is my first week participating in the Sunday Supper Movement, themed “summer BBQ party.” If you have Twitter and follow at least one person related to food blogging, you know what the Sunday Supper Movement is, or at the very least you have heard of it. 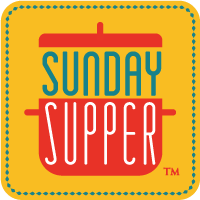 I don’t know how long I kept seeing #SundaySupper before I actually decided to investigate it and now here I am, actually doing it! Essentially each week (on Sunday, go figure), we all come together to share our recipes related to the given topic. Scroll down a bit and you will find links from all of the other participants. With any luck, you will find plenty of BBQ dinner recipes to sop up all of the alcohol in this sangria. So then you can go and have another glass of this sangria. Strategy my friends, strategy. Refreshing summer stone fruit sangria. Start chopping! Get all of your citrus and stone fruit sliced and put it in a large pitcher. Pour in all of the liquids, except for the sparkling beverage you choose to use (7-UP, ginger ale or club soda). Let the fruit, wine and other ingredients macerate for at least a couple of hours, or even overnight. When you are ready to serve, pour the glasses ⅔ to ¾ full of sangria mix and then top them off with the sparkling beverage of your choice. Obviously the more you add, the more diluted it will be. If you prefer your sangria not too sweet, stick with the club soda, as the other pop will just add more sugar. I have an uncanny knack for liking ingredients that most people find repulsive. Blue cheese. Really any cheese that smells more like feet than it does food. Chocolate so dark that it is basically unsweetened. Mushrooms that look like they were plucked straight out of an enchanted forest. But if there’s one thing that I struggle to wrap my head around, it’s wine. I want to like it, I really do. I understand the virtues of pairing it with foods to make them taste even better. Except that in my mind, it still makes them taste worse. Lately I’ve changed my tune a bit. White and rosé I can tolerate, red, not so much. Consistent with most of my other tastes, the sweeter the better. Did someone mention sangria? I’m in. These spritzers are a more “wintery” take on sangria. Pomegranate, cranberry and pear are all flavours that scream “holidays!” to me. Christmas; it’s the ultimate time for consuming alcoholic beverages and it’s less than 2 months away. You could totally make a non-alcoholic version too using half cranberry juice and half sparkling water. But let’s face it, even the kids get into the wine at Christmas. Who are we trying to kid? Ha that pun was totally unintended. Ginger would be awesome in these too. You could even substitute the sparkling water for ginger ale. Wine + juice + fruit + sparkling drink = endless possibilities. Just like other acquired tastes, I think that if you gradually condition yourself, you can gain an appreciation for wine. Add in some fruit and you pretty much have me convinced. I may still be a long way from appreciating the tannins in a nice cabernet sauvignon but I will get there eventually. Or at least one can hope. In each glass pour 1/2 cup wine and 1/4 cup each cranberry juice and sparking water. Adding 2 heaping tablespoons of both diced pears and pomegranate seeds to each. Drink up! I’ve been in a bit of a rut with my blog lately. Come September, The Starving Student will turn 2 years old! 2!!! I’m not sure where the time has gone. All I know is that a lot has happened since the sad, homesick me decided to start a food blog because she had nothing better to do (other than mope around in her dorm) before culinary school started. Now that I’m in university, I actually have to spend time taking notes and studying in general. In culinary school, this was a pretty foreign concept. But at the same time, I don’t want to give up on this altogether. It’s an outlet for me. The problem is, depending on my schedule with school, work and everything else, I’m not always home to cook dinner or bake up a delicious batch of whatever it is that I’m craving. Not only that, but if I really want to grow The Starving Student, I need to make a niche for myself. Everyone has a food blog nowadays. It’s actually pretty depressing impressive when you scour the internet and see the thousands of truly high-quality blogs that are out there. I’m just a tiny fish struggling to manoeuvre my way through an over-crowded sea (if only our oceans were actually like that). At the beginning of July I had the opportunity to volunteer out on the Siksika reserve, cooking for volunteers and residents that were cleaning up after the floods. It was a pretty exciting day cooking with some big hitters in the Calgary culinary scene. Our “head chef” for the day was Chris Shaften, formerly on Top Chef Canada. We were also joined by Dan Clapson, who writes for such publications as Avenue Magazine. As a fellow food blogger, his best advice for me was to do something that sets me apart. I brought up the idea of somehow combining food and psychology (as that is what I am majoring in), and he loved it. But until now, I hadn’t figured out how I was actually going to do so. I finally think I have come up with some ideas to integrate the two concepts into a section called “Food for Thought”. Not only will it give me the opportunity to post more often, it will hopefully provide some new and exciting material that people haven’t really considered before. By no means am I going to quit posting recipes, instead I am going to throw in a combination of topics to make the blog a bit more well-rounded. I also plan on adding extra tidbits about hikes and other outdoorsy activities that I enjoy doing. Really, I just want to be able to post about things that I love and hopefully that passion will translate through to your reading experience! So that’s my New Year’s Resolution…in August. I’ve always been the first to say that I don’t believe in New Year’s resolutions because we should all make resolutions to be better EVERY SINGLE DAY. So here on Monday, August 19, 2013, I’m publicly stating that it is my goal in the coming days, weeks and months to blog MORE OFTEN and share thoughtful topics and INSIGHTFUL IDEAS. If I can make you think to yourself, “wow, that’s something I’ve never considered”, then I have done my job. Now I’m going to drink this Nutella banana smoothie and get typing. Stay tuned! Blend it up and gulp it down!